Although celery has been used as an herbal remedy for thousands of years, it is not well-known for its medicinal purposes in the Western world. 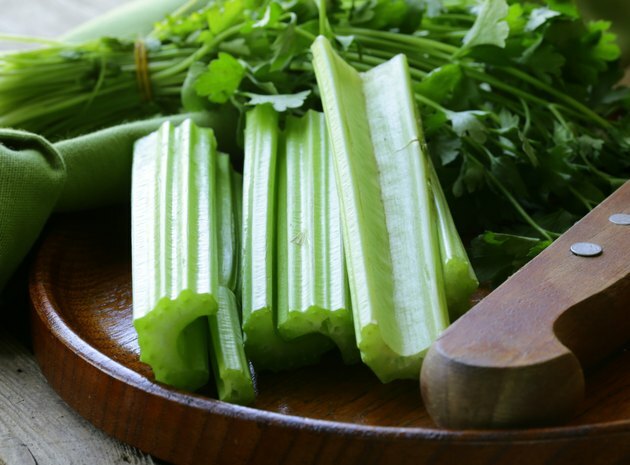 In the past, celery was used to treat a host of ailments, including the flu, liver disease, water retention and arthritis. Today, it is mainly used as a diuretic and to treat gout. Celery seed supplements are classified as a food by the FDA and therefore not tested for safety and efficacy. Ask your doctor first before taking celery seed as there are some side effects. The celery we know today originally grew wild in the Mediterranean region. Its scientific name is Apium graveolens, and it is related to fennel, carrots and parsley.The plant grows as a stalk to a height of two to three feet, and the seed is harvested from the flowers. The tiny seeds are tan to dark brown in color and have a spicy taste and strong aroma. Celery seed contains a number of biologically important substances, including flavonoids high in antioxidants, volatile oils, coumarin with anti-coagulating effects, the omega-6 fatty acid linoleic acid and the powerful healing compound 3nB, or 3-n-butylphthlalide. Celery seed is available as fresh or dried seeds and as a supplement in tablets, capsules, oil and an extract. There is a dearth of studies, so more research is needed. Natural Factors reports the evidence is promising regarding celery seeds' use in lowering blood pressure. It is also being used as an alternative treatment for gout, fibromyalgia, painful gas and bloating, rheumatic arthritis and as a diuretic to combat fluid retention. Celery seed oil has some sedative effects and is used for anxiety and nervousness. It may prove to be beneficial in lowering cholesterol and acting to protect the liver from damage. Although celery seed has not been well-studied as yet, there are several known side effects, including sensitivity to sunlight and skin rash. Taking large doses of celery seed can cause depression, fatigue and slow heartbeat. It is possible to have an allergic reaction to celery seed. If you are allergic to birch pollen, be careful about taking celery seed. Allergy symptoms include itching, hives, tightness in the chest, difficulty breathing and swelling of the lips and throat. Report any signs of an allergic reaction to your medical provider immediately. Never take celery seeds from commercially sold garden packages; those seeds are treated with harmful chemicals. Do not take celery seed if you are pregnant, as it can stimulate contractions and bleeding in the uterus. If you have kidney disease, you may not be able to take celery seed. If you take blood-thinner medication, diuretics, tranquilizers, sedatives or thyroid medication, do not take celery seed unless advised to by your doctor. Celery seed can interact with other herbal supplements, including angelica, horse chestnut, garlic, turmeric, ginger, goldenseal, lemon balm, St. John's wort and valerian. Be sure to discuss all your medications and supplements with your physician before taking celery seed.